Springfield Plastics, Inc. plastic drainage pipe and accessories are the ideal products for the homeowner to solve their drainage needs. 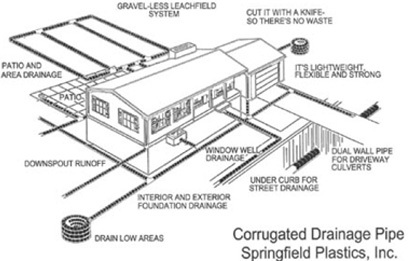 Whether it be foundation drains, downspout drains, area drains, road culverts or septic system leachfields, Springfield Plastics has the products for the homeowner. The products are easy to install and you can find installation instructions on this page if you are not sure what to do. Wet basement? Mold? The proper installation of Springfield Plastics, Inc's foundation drains will stop wet basements. Solve one of the leading causes of water in the basement. 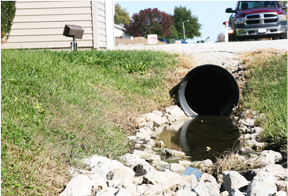 Avoid the need to replace your roadway culverts in 10 to 20 years. Our high quality pipe solves many of the problems with septic systems. Dual wall pit suited for high demand applications.